My long time readers know that I love to live a frugal life. They also know that I love to cook. 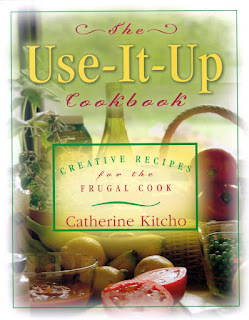 I was recently sent a book to review that wraps both of those loves into one, The Use-It-Up Cookbook: Creative Recipes for the Frugal Cook by Catherine Kitcho. This wonderful book tells you how to use all those bits and pieces of things you have in the refrigerator to make a yummy new dish. The book is divided into sections on specific foods like carrots, eggs, cheese, etc.. All the recipes sound quite tasty and the few I've tried worked out quite well. I do question the chapter on honey, as I feel it is more of a pantry staple than a "leftover". I did find that many of the recipes were great for when you need to use up eggs that are about to go bad or sprouting onions, etc. The book gave me quite a few ideas I have not thought of before. It also has an area to write in your own recipes, which I really like. Overall I feel this would be a nice addition to any kitchen. It has interesting, tasty recipes, and is well organized. If you are a are looking for ways to stretch your food budget, you might want to check this one out.